The Big Easy, New Orleans is the hub of the upper Gulf of Mexico coastline, with around 400,000 residents. The busy port city lines the banks of the mighty Mississippi south of Lake Pontchartrain and 113 miles northwest from the river delta. Founded in 1718 by French colonialists, the city centered around Jackson Square (originally named Place d’Armes) and consisted of just the Vieux Carre. Spanish rule of Louisiana followed between 1762 and 1801, before the territory was ceded back to France for a two year period. The Louisiana Purchase was sold to the United States in 1803, and the cultural dynamic of New Orleans changed with an influx of Americans and European immigrants. As the population increased, tensions rose between the newly arrived Americans and Europeans, who settled west of Canal Street in the “American Sector” (today’s Central Business District), with the established European Creoles in the French Quarter. Conflicts were a regular issue, and the Canal Street median became a neutral area where the two sides would meet to conduct business without imposing upon the opposite territory. This led to the New Orleans term “neutral ground”, used to describe city medians. New Orleans grew to the fourth largest city in the United States by the mid-1800s. Today the city is best known for Mardi Gras, the home of Jazz, and occasionally the Super Bowl. The cultural hearth of the city is unmatched by any other in the southeast states and perhaps the whole country. The history of New Orleans changed forever when the city was dealt a major blow by the landfall of Hurricane Katrina on August 29, 2005. The catastrophic storm raked the city with 115 mile per hour winds and a storm surge that toppled several sections of the protective levee system. During Labor Day weekend of 2005, some of the levees failed, allowing water from Lake Ponchartrain to inundate the city. The following weeks resulted in a full scale evacuation of New Orleans as 10 to 15 feet of water submerged portions of the city. Recovery efforts continued in the long term, but some nine months after the landfall of Katrina, the city remained a shell of its former self. It was estimated that just 225,000 lived in the city as of mid 2006, compared to 496,938 recorded in the 2000 census. Those numbers were expected to climb slowly as rebuilding continued, and by the 2010 census the population rebounded to 343,829. A number of roads and bridges were effected by the storm, leading to eventual upgrades or infrastructure improvements. See the Hurricane Katrina Road Information page for a summary of impacts on numbered highways during and after the storm. An often congested freeway serving most of metro New Orleans. The freeway enters the area from the west along a ten mile viaduct the Bonnet Carre Floodway along the southwestern periphery of Lake Ponchartrain. An elevated semi-directional T interchange joins Interstate 10 with I-310, a spur southwest to Boutte ahead of the viaduct end at Kenner. The freeway proceeds east at-grade with six to eight lanes and heavy traffic by Louis Armstrong New Orleans International Airport (MSY) to unincorporated suburbs of Jefferson Parish and Metairie. East across the Metairie Outfall Canal, I-10 enters Orleans Parish and the city of New Orleans, where it splits with Interstate 610 at an interchange rebuilt by early 2000. I-610 provides a cutoff across City Park to bypass Downtown while Interstate 10 angles southeast along the Pontchartrain Expressway to the Superdome. There it shifts northeast over Claiborne Avenue to the Seventh Ward. The Pontchartrain Expressway was constructed during the late 1950s while the elevated Claiborne expressway was built in the 1960s. The exchange linking the two freeways with the Pontchartrain Expressway southeast to the Greater New Orleans Bridge was improved in 1993/94. Interstates 10 and 610 reconvene between the Gentilly Terrace and St. Roch neighborhoods at a wye interchange. I-10 proceeds east from there across the High Rise Bridge over the Industrial Canal to New Orleans East, an area hard hit by Hurricane Katrina. The freeway returns to grade level and shifts north and east along a commercial corridor lined with service roads through to Interstate 510. The remainder of the route traverses wetland areas through Bayou Sauvage National Wildlife Refuge to Point aux Herbes and the 5.6 mile long twin bridges across Lake Pontchartrain. Freeway serving the southwest portion of the New Orleans metropolitan area. Interstate 310 angles southwest from I-10 along a 5.8 mile long viaduct system across swampland in eastern St. Charles Parish. Southward ahead of Destrehan, I-310 lowers to grade level briefly before rising onto the Hale Boggs Bridge across the Mississippi River. The cable-stayed bridge, which saw deck replacement in 1999/2000, joins Destrehan and Louisiana 48 with Luling and Louisiana 18. 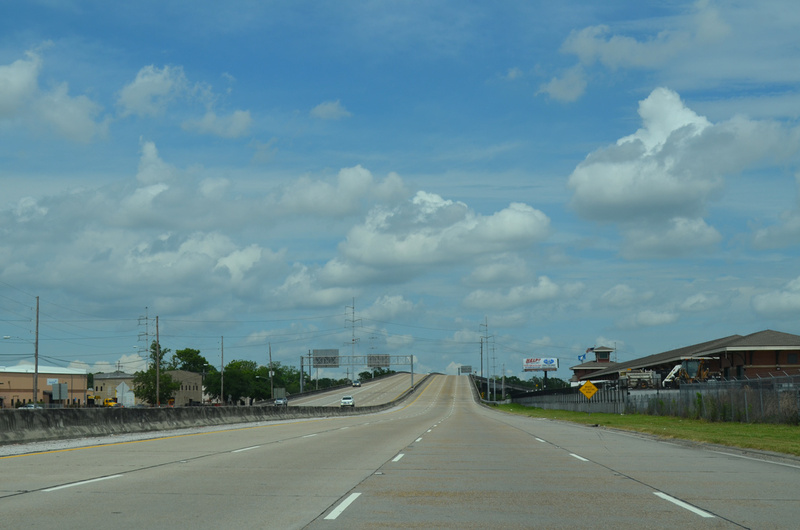 Interstate 310 runs along agricultural and suburban areas from Luling to a three-wye interchange with Louisiana 3127. Turning southeast across wetland areas, I-310 concludes at a partially built interchange with U.S. 90 by the community of Boutte. Stubs built into the exchange will extend the route to Interstate 49 South, or become a part of I-49 should the eastern most extent be dropped. Interstate 510 links Chalmette with Interstate 10 at New Orleans East in conjunction with Louisiana 47. The 3.16-mile freeway spur replaced Paris Road (old LA 47) southward from Little Woods to the Intracoastal Waterway Bridge by 1992. Louisiana 47 extends south from the steel through arch bridge to end at Louisiana 46 in the St. Bernards Parish seat of Chalmette. I-510 serves the NASA Michoud Assembly Facility and industrial areas within the Viavant – Venetian Isles area south of U.S. 90 (Chef Menteur Highway). The abandoned Six Flags New Orleans theme park is located southeast of the exchange joining I-10/510 as well. Traffic counts along Interstate 510 & Louisiana 47 ranged from 28,241 to 28,501 vehicles per day (vpd) as recorded by LADOTD in 2013. Traveling 4.3 miles, Interstate 610 allows through traffic to bypass the Interstate 10 legs south to the New Orleans Central Business District and French Quarter. The freeway concludes at wye interchanges with I-10 at both ends, is mostly elevated on viaduct, and crosses New Orleans City Park. Completed in stages between 1964 and 1975, the busy route topped out with 94,470 vpd in 2013. Interstate 910 is the unsigned designation for U.S. 90 Business along both the Pontchartrain and West Bank Expressways. With the long term plan to extend Interstate 49 southeast from Lafayette to New Orleans, LADOTD officials sought to redesignate U.S. 90 Business as Interstate 49 in 1999 in an effort to boost business development on the West Bank. The request was rejected, with FHWA officials instead designating the freeway as Interstate 910 as the 9.7 mile route met federal interstate standards.1 The route was never signed, but it was inventoried in the Interstate Route Log and Finders List starting with the October 31, 2002 edition. Concrete bridge system bisecting Lake Pontchartrain between Metairie and Mandeville on the North Shore. The first two lane bridge opened in 1956 with two-way traffic. A twin span was added by 1969, bringing the 24-mile route to four overall lanes.2 Separated by 80 feet, seven crossovers connect the two spans. Double leaf bascules located eight miles south of the North Shore allow the passage of tall ships. Openings are not conducted during the morning or evening peak hours during weekdays. Causeway Boulevard joins the north end of Lake Pontchartrain Causeway with U.S. 190 west directly. Additionally approach roads provide access to Louisiana 22 west to Madisonville and U.S. 190 east to Mandeville. U.S. 190 provides a direct connection to Interstate 12 and Covington via a freeway. Causeway Boulevard originates to the south at River Road in Jefferson. Louisiana 3046 lines the route north from ramps with U.S. 90 (Jefferson Highway) to a circle interchange with U.S. 61 (Airline Drive). North of there, the boulevard transitions into a busy commercial arterial through Metairie and the Causeway south end. The cloverleaf interchange with Interstate 10 was upgraded between 2009 and 2012 to add flyovers and eliminate weaving traffic patterns. Traffic counts north of the exchange top out above 100,000 vpd. 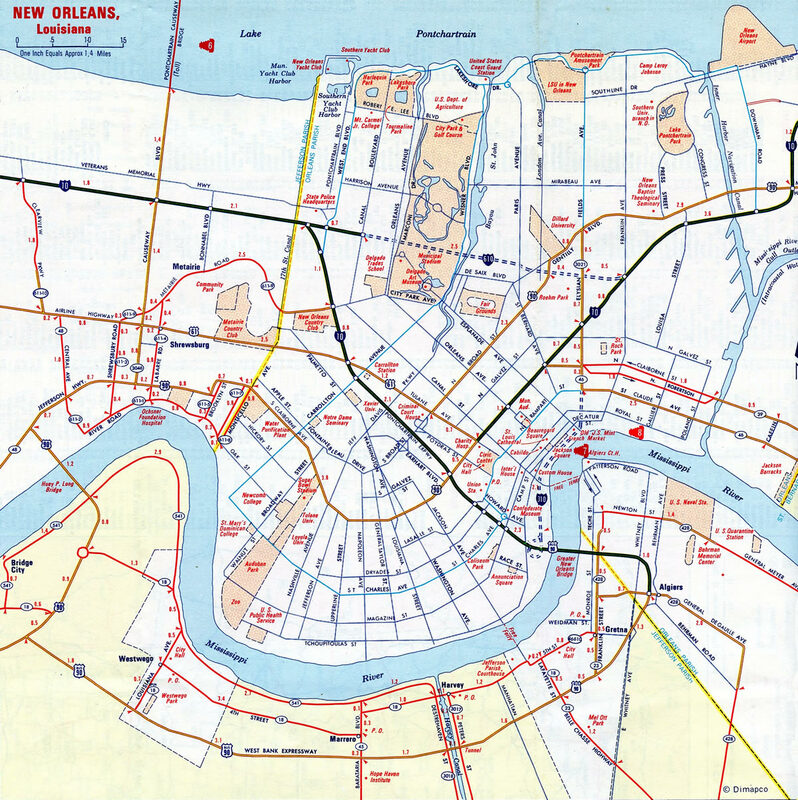 Older road maps show Causeway Boulevard as the Greater New Orleans Expressway. An early signing system directed motorists to the south end of Lake Pontchartrain Causeway with a color code system of markers. The system used red markers for traffic into New Orleans and points east. Green markers led drivers to U.S. 90 and points west, while blue markers directed traffic to Baton Rouge and connections along U.S. 61. A study in 1969 attempted to reinforce the concept of an outer belt freeway system between the Riverfront and Earhart Expressways. The plan also envisioned a new Mississippi River crossing uptown via Earhart Boulevard at Napoleon Avenue.7 The Earhart Expressway was to travel from Louisiana 49 (Williams Boulevard), near New Orleans International Airport (MSY), eastward to the Pontchartrain Expressway via Earhart Boulevard. Following the cancellation of the Riverfront Expressway proposal, the Earhart Expressway was rescinded westward to the New Orleans and Jefferson Parish line. The portion of the Earhart Expressway within Jefferson Parish was constructed. However, some elements were left unbuilt, such as an interchange with Causeway Boulevard and an eastbound off-ramp to U.S. 61 (Airline Drive) near the New Orleans city line. The northern terminus also alludes to further extension, with stub ends and a wide right of way at Louisiana 3154 (Dickory Drive). Louisiana 3139 south otherwise transitions to Earhart Boulevard, a four-lane surface route, through to Downtown New Orleans. The state route officially ends at the boulevard intersection with Monroe Street. The Earhart Expressway (LA 3139) east of Clearview Parkway (LA 3152). Photo taken May 9, 2015. Not really a business route in the conventional sense, U.S. 90 Business extends the Pontchartrain Expressway southeast from Interstate 10 between Central City and Downtown New Orleans to the Crescent City Connection bridges across the Mississippi River. The cantilever spans join the Pontchartrain Expressway with the Westbank Expressway as U.S. 90 Business turns south to the city of Gretna. The Westbank Expressway hooks southeast from Algiers in New Orleans to Ames Avenue in Marrero as a full freeway. West through Westwago, the expressway travels at-grade with a wide median to end at Avondale and U.S. 90. Future I-49 signs appear along the route. The Pontchartrain Expressway was expanded to include a new eastbound viaduct from 1980 to 1996. Construction during the $471 million project also added new flyovers linking I-10 west with U.S. 90 Business west and vice versa. The westbound viaduct along the freeway was also replaced and a reversible two-lane HOV roadway was erected between the two carriageways. The HOV roadway runs from the Algiers approach to the Crescent City Connection west to Earhart Boulevard and Loyola Avenue by the Superdome. Only 3.5 miles of U.S. 51 travels independent of Interstate 55 between the southern terminus at LaPlace and the Tangipahoa Parish city of Ponchatoula. The short stretch through the community of LaPlace constitutes a five-lane boulevard between U.S. 61 (Airline Highway) and a diamond interchange with Interstate 10. An adjacent half diamond interchange connects U.S. 51 with the elevated I-55 northward over the isthmus separating Lake Maurepas and Pontchartrain. The 28-mile overlap concludes on the south side of Hammond. A nine mile long Business Loop also joins I-55 & U.S. 51 with Ponchatoula and Downtown Hammond from Exit 23 north to U.S. 190 (Thomas Street). All of old U.S. 51 is passable as it parallels the Interstate 55 viaduct northward from LaPlace to Exit 22 by the South Slough outside Ponchatoula. The two lane roadway travels at grade by the abandoned settlement of Ruddock to a high level bridge across Pass Manchac to Manchac. Manchac is home to a restaurant, several docks and a handful of dwellings. A number of fishing camps and Port Manchac line the old highway further north. Historically, U.S. 51 overlapped with U.S. 61 southeast to New Orleans for route continuity. The alignment through La Place bypassed a narrow stretch of Main Street. Originally overlapped with U.S. 51 and U.S. 65, U.S. 61 was superseded by Interstate 10 from Baton Rouge southeastward to New Orleans. Known as Airline Highway or Airline Drive, U.S. 61 varies with four to six lanes either as a divided highway or commercial arterial throughout the metropolitan area. The highway offers an alternative to Interstate 10 from Laplace and Reserve eastward to Saint Rose and Kenner. A six-lane stretch through Metairie crosses paths with Causeway Boulevard (LA 3046) at a 1957-built rotary interchange, where an elevated traffic circle connects ramps with both roadways. Entering New Orleans at Holly Grove, U.S. 61 transitions onto Tulane Avenue to parallel I-10 (Pontchartrain Expressway) through Mid-City to end at U.S. 90 (Broad Avenue). U.S. 90 follows a somewhat convoluted street routing throughout the city of New Orleans and Jefferson Parish. The highway enters Orleans Parish across the Rigolets to run southwest along a narrow strip of land separating Lakes Pontchartrain from St. Catherine. Elevated homes, fish camps and boat docks line the route as it travels just 4 to 10 feet above sea level. Spanning Chef Menteur Pass, U.S. 90 reaches the community of Venetian Isles. A short distance west from there is a levee and the south end of U.S. 11. Crossing another levee, U.S. 90 enters the Viavant – Venetian Isles area at just two feet above sea level. The four lane route expands to include a grassy median from Industrial Parkway west by the NASA Michoud Assembly Facility to Interstate 510. Chef Menteur Highway separates industrial areas to the south from the Read Boulevard and Plum Orchard residential street grid through to the first meeting with Interstate 10. Interstate 10 passes south of U.S. 90 as Chef Menteur Highway travels west through the Pines Village community to a lift bridge across the Inner Harbor Navigational (Industrial) Canal. Beyond a retail area in Gentilly Woods, U.S. 90 shifts onto a tree lined boulevard (Gentilly Boulevard) west to Dillard University and the couplet of New Orleans and Allen Streets. The one-way pair converges south of I-610 as Broad Street to the Fair Grounds and 7th Ward communities. Broad Street angles U.S. 90 southwest to Tulane Avenue, where U.S. 61 begins and U.S. 90 turns southeast through Tulane – Gravier to the Claiborne elevated freeway for Interstate 10. Claiborne Avenue parallels the I-10 viaduct southwest by the Mercedes-Benz Superdome to emerge from the freeway at Central City. Prior to sometime after the 1960s, U.S. 90 used Canal Street between Broad Street and Claiborne Avenue. Advancing from Central City, U.S. 90 takes the curved alignment of Catherine Street northwest to Tulane University and East Carrollton to exit the city from the Leonidas community. Beyond the Orleans Parish line, U.S. 90 follows Jefferson Highway through a mixture of industrial and residential areas through Jefferson to the Huey P. Long Bridge at Clearview Parkway (LA 3152). Carrying two railroad tracks and six lanes of traffic across the Mississippi River, the high level cantilever bridge was expanded during a $1.2 billion project between 2006 and 2013. A short stretch of freeway extends south from the Huey P. Long Bridge through Bridge City to Louisiana 18 west. South from there, U.S. 90 Business returns to U.S. 90 from the Westbank Expressway at a folded diamond interchange. The remainder of the drive west through Avondale, Mimosa Park and Boutte travels at grade as a busy trucking corridor to Interstate 310. Area wetlands along this corridor will likely require the Interstate 49 South corridor to parallel U.S. 90 along elevated roadway. The high costs with a bridge system may lead to a truncation of the route to end at I-310 and U.S. 90 at Boutte instead of to the east along the West Bank Expressway. Louisiana 23 begins at Gretna opposite Louisiana 18 (Lafayette Street) at the Westbank Expressway (U.S. 90 Business). The state highways travels southward along a busy arterial route to the Belle Chase Bridge and Tunnel across the Intracoastal Waterway. Beyond the crossing, Louisiana 23 curves southwest to Belle Chase and NAS JRB New Orleans. Becoming rural, Louisiana 23 extends another 66 miles as a Great River Road along the Mississippi River to Venice and the river delta. Prior to the completion of the Greater New Orleans Bridge (U.S. 90 Business), Louisiana 23 utilized the Jackson Avenue Ferry between Gretna and the city at Irish Channel and St. Thomas. Jackson Avenue extended the route northward to U.S. 90 (South Claiborne Avenue) in the city. Together with Jackson Avenue and Huey P. Long Avenue south to 4th Street in Gretna, both alignments were historically a part of Louisiana 2. The rest of the highway south of Harvey was designated as Louisiana 31. The Pelican State renumbered its highway system by 1957-58. This state highway begins at the turn of U.S. 90 from Claiborne to Tulane Avenues at the Central Business District in New Orleans. Louisiana 39 runs along the side or underneath the Claiborne elevated freeway of I-10 northeast to St. Bernard Avenue in the Seventh Ward. Louisiana 39 emerges there with flyover ramps connecting the freeway from the Claiborne Avenue neutral ground at Pauger Street. Claiborne Avenue forms a couplet with Robertson Street east from Elysian Fields Avenue through the St. Roch and St. Claude communities. The one way pair converge at a lift bridge across the Inner Harbor Navigational (Industrial) Canal into the Ninth Ward. Judge Perez Drive continues Louisiana 39 east into St. Bernard Parish to Chalmette. Southeast from Chalmette, Louisiana 39 arcs through a mixture of residential and agricultural areas to intersect Louisiana 46. The two highways form a wrong-way overlap west to Poydras. The remaining 38 miles of Louisiana 39 then mirror the course of the Mississippi River southward to Bohemia. The original Louisiana 39 followed the current route of Louisiana 46 from Elysian Fields Avenue eastward to Chalmette. The two highways switched places by the late 1960s. Traveling 6.0 miles along Woodland Highway and River Road, Louisiana 406 arcs north from Louisiana 23 at Belle Chase to Patterson Road along the Mississippi River in southeast New Orleans. The first confirming marker for Louisiana 406, posted as Woodland Highway leads away from Louisiana 23 (Bell Chasse Highway). This scene changed by 2011 with the addition of an acceleration lane. The LA 406 marker was removed during the project. Photo taken 08/02/02. Louisiana 407 begins and loops onto a high rise bridge across the Intracoastal waterway from Louisiana 406 at New Aurora. The remainder of LA 407 spurs east to English Turn. Photo taken 08/02/02. A roundabout replaced the at-grade intersection between Louisiana 406 and 407 by 2011. LA 407 angles northwest to LA 428 and the Algiers neighborhood. Photo taken 08/02/02. Louisiana 407 begins and loops onto the high rise Intracoastal Waterway Bridge from Louisiana 406 (Woodland Highway) at New Aurora in southeast New Orleans. Photo taken 08/02/02. The Louisiana 407 span over the Intracoastal Waterway is one of two crossings joining New Orleans and Terrytown with the English Turn area and Bell Chasse. Additionally, because Louisiana 23 utilizes the Belle Chase Tunnel on southbound, all hazmat cargo bound for points south is diverted onto this bridge. Photo taken 08/02/02. The Downtown skyline and Crescent City Connection Bridge appear along the northern horizon as Louisiana 407 descends toward the Algiers section of the city. Algiers is located along the Mississippi River near the Greater New Orleans Bridge. During the late 19th Century, a devastating fire ravaged this portion of the city. Photo taken 08/02/02. Louisiana 407 northbound turns onto Woodland Road from General De Gaulle Avenue at Louisiana 428. LA 407 follows Woodland Road northward to General Myers Avenue, which is also a part of LA 428. Photo taken 08/02/02. Elysian Fields Avenue is a tree lined parkway north from Peters Street in the Marginy neighborhood to Ponchartrain Beach and the University of New Orleans. The four lane boulevard sees high speed ramps at I-10 leftover from the Riverfront Expressway proposal and a diamond interchange with I-610 at Gentilly. Providing an alternate route to the French Quarter, Elysian Fields Avenue is designated as Louisiana 3021 for 1.84 miles south from U.S. 90 (Gentilly Boulevard) to LA 39 (Claiborne Avenue) and as LA 46 between Claiborne and St. Claude Avenues. Elysian Fields Avenue northbound at Louisiana 46 (Saint Claude Avenue). Louisiana 46 west turns onto Elysian Fields Avenue north to end five blocks ahead at Louisiana 39 (Claiborne Avenue) in the Seventh Ward. Louisiana 46 east travels through the St. Claude and Bywater neighborhoods to the Lower 9th Ward. According to a 1966 map, this stretch of Louisiana 46 was originally signed as Louisiana 39. Photo taken 12/21/07. Louisiana 3021 separates to accommodate on-ramps from Intestate 10 between Galvez Street and Florida Avenue. The two wye interchanges were built between Elysian Fields Avenue and the elevated freeway as part of the canceled Riverfront Expressway. Photo taken 12/21/07. A four lane viaduct along Elysian Fields Avenue (Louisiana 3021) north spans Florida Avenue and a CSX Railroad midway between ramps with Interstates 10 and 610 at the St. Roch neighborhood. This antiquated sign bridge directed motorists to the Florida Avenue off-ramp on this stretch. The assembly was removed by 2007. Photo taken 03/20/02. A diamond interchange connects Interstate 610 with Louisiana 3021 (Elysian Fields Avenue) at Benefit and Humanity Streets on the south side of the Gentilly Terrace neighborhood. I-610 east merges onto I-10 east nearby while the freeway westbound continues toward City Park. Photo taken 03/20/02. Completed by 1973, Clearview Parkway links the Huey P. Long Bridge (U.S. 90) with U.S. 61 (Airline Drive). Carrying six lanes of traffic, the congested arterial bisects residential areas northward from Airline Drive to a cloverleaf interchange with Interstate 10. Flyovers replaced an antiquated interchange joining Clearview Parkway, Jefferson Highway and the Huey P. Long Bridge as part of the seven year upgrade of the cantilever span. Airport Road comprises a limited access highway in the city of Kenner. The four-lane highway connects Interstate 10 and Veterans Boulevard with the passenger terminal of Louis Armstrong New Orleans International Airport (MSY) and U.S. 61 (Airline Drive). A concrete divider and decorative lighting replaced the double yellow line separating traffic on Airport Road by 2002. Speed limits were also increased from 35 to 45 miles per hour. Approaching the partition of traffic for Veterans Boulevard and the eastbound flyover to Interstate 10 on Airport Road north. Photo taken 12/28/02. Entering the half diamond interchange with Veterans Boulevard on Airport Road north. There is no direct access to Interstate 10 west. Instead motorists must take Veterans Boulevard east to Louisiana 49 (Williams Boulevard) north and access the freeway there. Photo taken 12/28/02. One of the main tourist destinations for New Orleans and the Vieux Carre, Bourbon Street flows northeast from Carondelet Street to Pauger Street. The street is open to vehicular traffic by day and restricted to pedestrian traffic at night. An array of businesses line the street including souvenir shops, jazz themed restaurants and clubs, bars, and adult entertainment. Hundreds or thousands pack the sidewalks and street well into the early morning hours as barricades block vehicular traffic. Canal Street forms a four to six lane thoroughfare from the Mississippi riverfront at Harrah’s casino northwest to City Park Avenue. An RTA Streetcar line accompanies the boulevard from end to end. Carondelet Street flows north from Central City through the Central Business District to become Bourbon Street at Canal Street. The Saint Charles Streetcar line accompanies Carondelet from Howard Avenue to Canal Street at the French Quarter. A lost highway in a sense, Jackson Street once carried U.S. 90 and Louisiana 2 from a ferry landing on the Mississippi River northward to Claiborne Avenue. The historic route for U.S. 90 coincided with a ferry landing on the west bank of the river at Harvey. When U.S. 90 was later relocated on its current course near Tulane University, Louisiana 23 took over the Jackson Street Ferry and surface route from Harvey northbound until the Greater New Orleans Bridge opened. One of many divided boulevards within the city of New Orleans, Saint Charles Avenue doubles as a streetcar line. The four lane thoroughfare links Tulane University, the Garden District, the Central Business District and the French Quarter at Royal Street. Cars on the Saint Charles Streetcar line are painted green. “I-910 May Pave Path in N.O.” The Times-Picayune (New Orleans, LA), April 1, 2000. “59-year-old Causeway bridge at a crossroads: Make it safer? Wider? Or keep as it is?” The Times-Picayune (New Orleans, LA), July 16, 2015. “Causeway speed limit bumped to 65 mph?” The Times-Picayune (New Orleans, LA), April 4, 2007. “Canopy removal will prompt temporary closure of northbound Causeway bridge.” The Times-Picayune (New Orleans, LA), January 20, 2011. “Major Bridges of Louisiana.” Preconstruction Pages (LADOTD), Volume 2,1. Priola, Justin. Email: Just 27, 2002. “Moses’ New Orleans.” Fred Robertson, http://www.robertsongovernor.org/moses.htm. Causeway Boulevard – Earhart Expressway Interchange. LADOTD, public hearing notice. July 8, 2015. Sketchler, Marc. Email: “Canal Street New Orleans name origin,” August 19, 2007. Thanks also goes to Andy P. Jung and Justin Priola for assistance with this guide. Page Updated October 3, 2016.